The GIS Resources Python Add-in adds a toolbar full of useful GIS resources to ArcMap. When you click on one of the buttons, it opens the website in your browser for the resource that was clicked. If the toolbar didn’t automatically add to ArcMap, go to Customize –> Toolbars –> and click on GIS Resources. 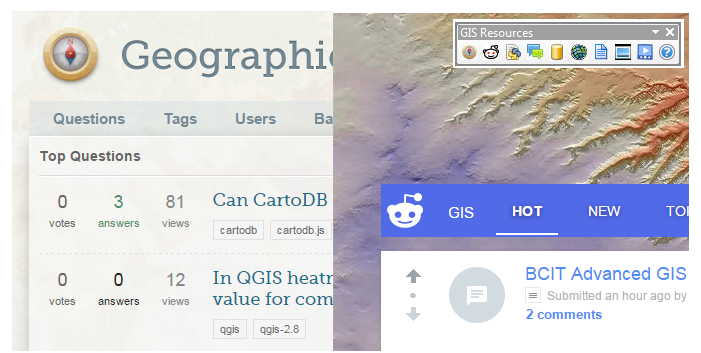 If you’d like an additional GIS Resources added to the toolbar, just leave a comment below! I hope you find this tool useful. Please leave a comment if you have any questions or problems, and be sure to check out the other tools I’ve created! Hi, when the 10.4 version ? Hi Dany, I uploaded the 10.4 version. Thanks for the reminder. Would you mind, how to explain esriaddin-Modules for ArcGis-Desktop higher than 10.1 ? With the EsrAddin-Wizard, it seems to be possible, to create addins for 10.1 only !